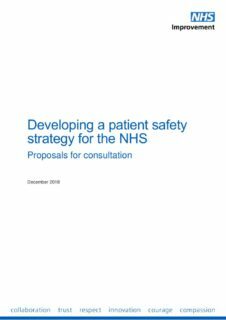 NHS Improvement consulted on a patient safety strategy for the NHS. The consultation ran from 14 December 2018 to 15 February 2019. The PDA generally welcomes and supports the proposals in the consultation. However, there is a significant need for increased focus on systems issues affecting medicines safety in pharmacy. Adding a fourth principle titled ‘systems improvement’. A fourth aim should also be added: To foster a systems approach to patient safety which considers organisational and wider systems issues and involves staff working in patient-facing roles, on the front line of care, in systems design and decision-making. To improve transparency, the Freedom of Information Act ought to be strengthened by introducing individual and organisational sanctions for a failure to promptly comply. The circumstances under which information must be disclosed by community pharmacy providers should also be broadened and strengthened so that it is easier for the public to access information. UK whistleblowing legislation must be replaced to improve the support and protections that enable whistleblowing. The reports submitted to the Patient Safety Incident Management System should be easily searchable by members of the public, so that they can access information and trends about reported incidents, for example by provider. The Patient Safety Incident Management System for community pharmacy would benefit from independent review. Our understanding is that its predecessor, the National Reporting and Learning System, was reviewed by Pharmacy Voice, which represented pharmacies as businesses and not the profession or pharmacists per se. According to James Reason’s Human Error: Models and Management, “Seeking as far as possible to uncouple a person’s unsafe acts from any institutional responsibility is clearly in the interests of managers.” It is important that the incident reporting and management system, by design, is capable of reflecting institutional responsibility where it exists. The PDA would be happy to assist in reviewing the PSIMS. An independent patient safety systems advisory group is needed in pharmacy, with significant input from front-line pharmacists and separately from those with expertise in the field who do not have the conflict of working in, reporting to or representing the interests of pharmacy employers or their managers. 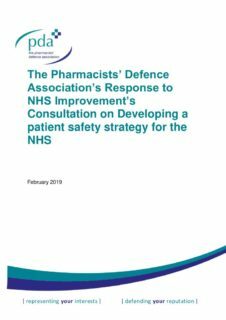 The group’s role would be to make recommendations about and advise on patient safety systems – to employers, the government, pharmacy regulators and MPs. Patient safety specialists should be qualified healthcare professionals such as doctors, dentists, pharmacists or nurses. Front-line pharmacists must be central to the work on medication safety and integral to the other workstreams, such as antimicrobial resistance, mental health safety and infection prevention and control. There must be a separate organisation focusing on patient safety in the NHS. This must not be integrated with the NHS commissioning functions. In the spirit of taking a systems approach to patient safety, some of our recommendations may be beyond the direct remit of NHS England and NHS Improvement, but they may be things that those organisations could help to influence.